PVH Employee of the Year Brittany Hollingshead is pictured with Glen Washington, FACHE, PVH CEO. 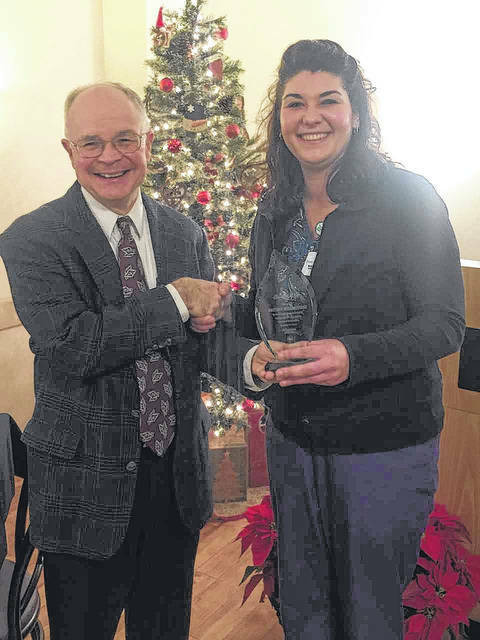 POINT PLEASANT — Pleasant Valley Hospital announces the Customer Service Employee of the Year for 2017 is Brittany Hollingshead. Hollingshead works as a receptionist in the Radiology Department. Her recognition of this honor was announced during the recent PVH Christmas Dinner. She received a trophy, a check for $250 and a VIP parking spot for the year. The PVH Employee of the Year Program recognizes professional and support staff that make exceptional contributions to the Hospital. All PVH representatives are encouraged to nominate colleagues who deserve this special acknowledgment. Hollingshead started her career with Pleasant Valley Hospital on July 10, 2006, in Radiology as an MRI Assistant. She transferred to Nursing Services on Dec. 16, 2006, and worked as a Nursing Assistant. On September 7, 2007, she transferred to the Business Office and worked as a Admitting Clerk. On Dec. 1, 2008, she transferred to Radiology, where she currently works as a Scheduler/Authorizer. Hollingshead lives in Point Pleasant, W.Va. She has three sons, Charles, Shawn and Blessed. Her parents are James and Vicki who are also employed at PVH.